I'm honored to welcome author, Mila Ballentine to the blog today. She's blogging on a very important topic. . .COVERS!! Don’t let the cliché, 'Don’t judge a book by its cover,' sway you. Everything is judged by its cover, whether it’s an object or a person! The presentation of a product for sale is important. If you’ve ever been attracted to a particular product while shopping, 9 out of 10 times it had everything to do with the presentation. However, the contents are equally important, but this article will focus on what’s on the outside. I went to a small business workshop a few months ago and the instructor recommended a book by Paco Underhill, WHY WE BUY. It’s worth the read and it’s available in audio book. It was helpful and reinforced aspects of marketing that I already knew. As an independent publisher/author, I devote as much time to choosing a cover as I do to writing. Without a cover that represents the essence of your story, you are simply nailing your foot in the “No Name Brand,” market. I think we all have a sense of how people feel about “No Name Brand” products….low grade, cheap, imitation…you get the idea. When your cover has the presence of attracting the naked eye, the odds are, they will move in and investigate the product. If the Blurb grabs them, you caught one! However, you had to get their attention first! It took two weeks to find the cover for IN THE VALLEY OF MUD AND WORMS, but I knew it was ‘the one’ when I saw it. It represented the character and the story, but you wouldn’t know until you read it. I was not as lucky with finding a cover for NO STRAYS ALLOWED, so I illustrated it myself. The optical illusion tricks the eye to think that something is wrong. The effect …you move in closer to see if your eyes can correct the error, but there is none. 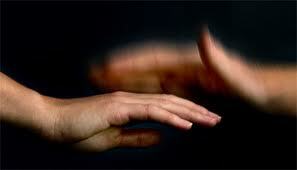 It’s effective because the potential customer interacts with the product. 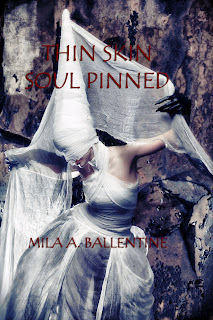 Finally, the cover for THIN SKIN SOUL PINNED took three mind-numbing weeks to find, but it was worth it! Marketing a product is not an easy task. The next time you go shopping, think about why you buy something. I am interested to hear your thoughts on this subject. "I'm going to make this post ROCK!" "I'm going to be the best guest blogger this blog has ever seen!" 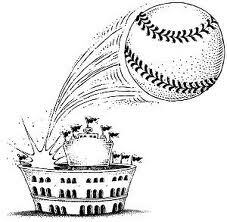 When you guest blog, you want to HIT IT OUT OF THE PARK! Know the blog's audience. I hope that you have been following the blog you want to guest on. If not, see my etiquette blog. If the blog is geared toward readers, make sure that you write your post that will interest readers. If you guest blog and your post has NO interest to the reader, you will have an EPIC FAIL. You always want to add a little personality to your blog. 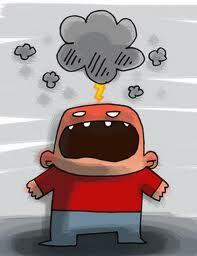 There is nothing more boring than going to my favorite blogs and read a guest blog that reads blah, blah, blah to me. A little personality goes a long way. The more personable you are, the more the audience is going to follow you other place. When guesting, be sure that you answer the WIIFM. With time, effort, and a lot of consideration on what you want out of your guest blog posts, you will SHINE! Do you have some more tips and tricks to share with our fellow writers?? 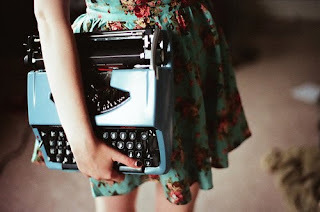 For the next couple of blog days, we are going to talk about guest blogging. It's something we all have to do whether we want to or not. But we need to in order to help connect with our target audience. There are so many blogs out there, and so many blogs that we follow that have the target audience we'd LOVE to have. The only way we can get the collective audience to notice us is through being a guest blogger. Here are some tips on how to effectively land that guest post gig! 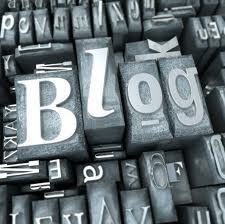 1) Visit the blog regularly. I really can't stress this enough. When I say visit the blog regularly, I mean participate too! Bloggers are more than likely to happily host someone who has been supporting their blog and doing so means that you need to comment. You obviously need to contact the blog owner. Be sure to have the email going to the right person. Address the person by their full name. * Tell the blog owner why you like their blog. * Tell them you would love to pitch a guest post along with why you think you would benefit their readers. 3) Attach an example of a guest blog. * Make sure you check the guest post guidelines. * In the guest blog be sure it's targeted toward the target audience of the blog you are proposing. * In your guest post, link to a few of your posts on your blog. This helps the reader find YOUR blog quickly. * Include a brief bio at the end. * Include links where they can find you. * YOU do all the work. Don't make the blog owner do anything! Follow the above guidelines and there is NO way a blog owner can say no. Do you homework and do it right! What do you do to get a guest spot on your favorite blogs?? Monday we are going to have tips on how to make your blog stand out and shine! I debated on whether to write this post, but I was so angry that I really felt like a post like this one would help you, the writer. First off let me say that this blog is for you, the writer. IT'S NOT FOR MY READERS! That is what my STREET TEAM is for. Lately I have come across some real issues, etiquette issues. There is still a code of behavior that we writers have to use when it comes to other writers. Most newbie writers (which is most of my blogs target audience) are so excited that they just want to connect with other writers. Not only do they want to connect with other writers, they want to connect with other writers target audience. The problem is. . .writers forget the proper etiquette on how to go about doing this. * You need to comment frequently on the blog you want to guest blog on. Don't just show up as a phantom follower by sending an email telling the blogger that you LOVE the blog and would love to guest. The blogger knows that deep down you want something....to tap into their audience. BUT what have you done for them? You might have read their blog, but did you participate? I MEAN REALLY PARTICIPATE?? * After you send an email to the blogger to guest blog, give the blogger a few weeks to respond. Don't be persistent and don't re-send a follow up email. Wait a month until you do send that follow up email. If your blog tour is in a month....you didn't do your job. You need to have your blog tour scheduled TWO months in advanced. 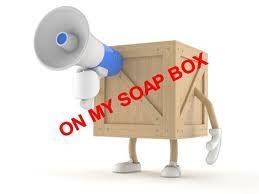 If you don't hear from the blogger after two requests, then they are ignoring you! Stop emailing them. * If you are lucky enough to get the guest spot that you so graciously requested, it's up to you to promote your guest post. DO NOT MAKE THE BLOGGER DO ALL THE WORK!!!! When I have a guest blogger, I stalk their Facebook, Twitter, Goodreads, Triberr, every single form of social media to make sure they are promoting their spot on my blog. If they don't, I will never have them on again. This is RUDE! So it's up to you to promote your guest posts. * Facebook! DO NOT MAKE A PAGE AND ADD OTHERS WITHOUT THEIR PERMISSION!! There is nothing more aggravating than getting on my Facebook and getting tons of feed from a group that I didn't join. I have been debating about this one because it's getting worse by the day. This is also RUDE! What makes you think that just because someone is on Facebook, they want to be in some group? What gives you the right to put them in a group without asking them? DO put a status up on your Facebook page that tells your group of friends that you are starting a new group, give a few deets about the group along with the link, and then let them decide. DO post a nice little invite on your other groups that allow self promotion with a link. LET them decide if they want to join your group. DO NOT POST A PROMO ON SOMEONE'S FACEBOOK PROFILE OR STREET TEAM unless you ask the owner of the page!! THIS BOILS my blood!!! And it's RUDE!!! This makes them a POACHER and unlikable!! 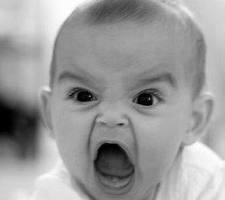 When another writer posts on any of my Facebook pages promoting their adventures or books without asking me first, I delete it and it makes me mad. 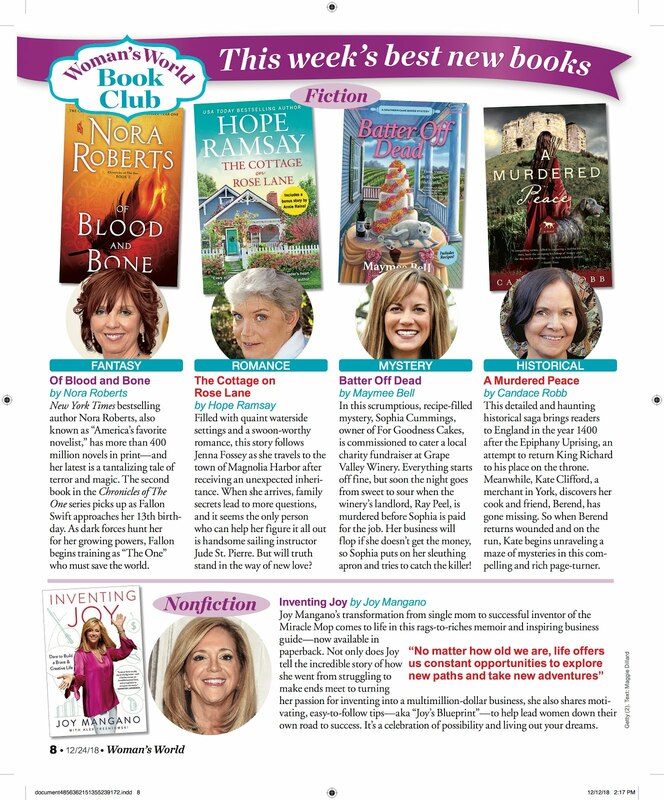 They are poaching MY readers that I have worked years to get. Not to mention that my readers aren't there to be POACHED!! I'm all about helping each other out, but not when I'm taken advantage of and the author thinks she/he has a right to do that because we are cyber friends. It's not only RUDE to me, but it's spamming my STREET TEAM. On the other hand, if you message the person who owns the page and ask them if they can post on your page, that is a different story. When someone is polite enough to message me and ask me if they can post their book or their new page on my page, I generally agree. I don't let them post their promo stuff on my STREET TEAM, but I will on my personal page and author page. Do you have any more etiquette tips to add? Did you see the new tab at the top? I'm taking proposals for guest blogs! Do you have what it takes? Click on the guest blog tab at the top or right of the page! Seriously, look at this! Doesn't this look divine? Heavenly? Let me tell you, IT IS! This week I'm lucky enough to be able to pry myself away from my group of guys (3 teenage boys, hubby, and two four-legged fury friends) at home and go to this exact cabin, in the woods, with two of my writer buddies (Heather Webber/Blake and Wendy Lyn Watson). We are all on deadline for our next novels. Heather is traditionally and indie-published with a book due to her editor at NAL (Penguin Group) on October 1st, and a deadline for her seventh book in her Nina Quinn series, that she's self-publishing, somewhere close to December. Wendy is traditionally published, and her deadline to her NAL editor is September 1st. I'm self-published and my deadline is August 15th. I know some of you aren't goal oriented. But when you are on deadline, or wanting to get the next book out, and whether you make a tangible goal or not, you have made a goal. You got that book completed and ready for publication. My goal at this retreat is to write 20k words. (blog post NOT included) Plus I know a little bit about where I need my story to go. I'm a panster, but about 100 pages into my novels I have a pretty good sense where the story needs to go until the end. That is when I make a list of scenes that I know have to go into the book. And you don't have to write those scenes in order! This is a great way to get the flow going. If you are more motivated about the murder scene or one of your conflict scenes, write it. You can stick it in the story later, or go back and beef it up during your edits. This will also get your flow going and lead to more writing. When you set a goal, it puts a concrete idea in your head and forces your brain to wrap around the idea that you have to get this done. So why not go ahead and set a concrete goal. 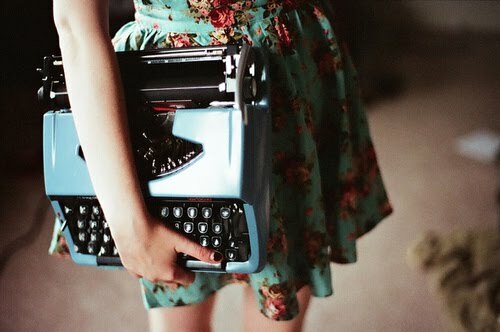 2) Keep a journal handy. Don't roll your eyes! We all know that I'm old school and love to write long hand. When you sit down to write, try to write a few sentences long hand to get your brain warmed up. 3) Set a timer for ten minutes. Sit down and write, ten minutes straight. Get up and walk around, and then set the timer again. Most times than not, you have begun your flow. 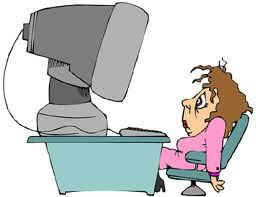 You hit the timer just to write one more sentence or finish the scene, and before you know it ten more minutes or thirty minutes have gone by and you are in the writing flow. 4) Create a writing work space. Here at the retreat, we each have our own bedroom if we want to go in there and just be alone with our laptops. We also have a nice deck outside with a few tables and chairs to plant ourselves and get the muse of nature on our side. Or we have the amazing section, comfy, big pillow couch where we have decided that is where we want to spend our time writing. The TV is OFF, the batteries are out of the ticking clocks (because I'm crazy and the tick makes me crazier) and the coffee is brewed in the pot. The three of us are here to write and keep us accountable. We aren't going to lounge around and flip on the TV (okay, I did last night for Big Brother and Project Runway), but we are setting our environment to get into the writing flow and get some words on the page. Now....go get in the mood to write! Let the words FLOW! Do you have any tips for our writer friends on how to help them GET INTO THE FLOW OF WRITING? If The Word. . .er. .. Shoe Fits~Wear IT! 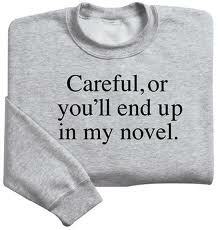 As a matter of fact, this t-shirt is a bestseller among all the writer's cafe. I didn't get one of those though, I got the pink Writer Girl one and LOVE it! The funniest thing happened to me and made me cackle from the tips of my toes to the split-ends in my hair. Someone actually accused me of using their likeness to them, when in all reality the fictitious character was named and taken from a winner of a reader contest I had held on my STREET TEAM. The contest was "Name Tonya's new town and the victim will be named after you and you get a dedication in the book." I had an overwhelming number of entrants. The winner was Ann Miller and she was SO excited. It was a great way to connect to a reader. We talked back and forth, having a blast fleshing out the character. Soo....after I heard about someone, who is not even in my thought process, actually thought I was writing a character about them, made me pause (after I hysterically laughed of course). John Steinbeck couldn't have said it better: I have tried to keep diaries, but they didn't work out because of the necessity of to be honest. WOW! He is so right! AND people who don't write don't get this. 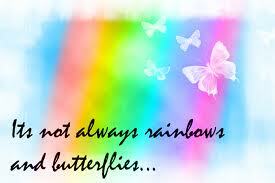 Everyday life is hard and there is NO way I want to sit down and rehash any thing from my real life, good or bad. When I write, I write to help my readers escape from their world, not bring them into my real world. When I write out my characters, I use a character worksheet and address book to make sure I have their features down pat. This helps me from book to book so I don't get their eye color or skin color wrong. The problem with description is that there is only so many hair colors, skin colors, body types, etc....to use. Again. . .it made me pause and think about the subconscious mind. Carpe Bead 'em was 110% taken from my life as a jewelry beader and my real life Aunt Grace. The novel is chick-lit, but it was the only chick-lit novel I have ever written. I'm a mystery writer. But Carpe Bead 'em was intended for my family to read and it ended up being the first novel I had published. After Carpe Bead 'em, everything I have since published is strictly fiction. OR is it? Or are my readers looking so deep below the surface that they take every single thing I write literal, creating the characters into their likeness? Can we really keep our memories or our subconscious mind out of our writing? At the end of the day, all I can say to my readers, good or bad. . . if the shoe fits. . .
Maybe I bought the wrong t-shirt. What about you? Do you let your real life interactions seep into your writing? There really is no way to dive into this blog post other than just diving in. GUESS THE F**K WHAT. . .
. . .really it's NOT! Making DECISIONS, and hard ones, are a harsh reality of this business~regardless of your publication journey. Today I'm going to talk about the Them vs Them. Romance Writers of America Vs themselves. Six years ago I joined RWA because I had to in order to join the only writers group in Cincinnati, you had to be a member of the national group which happens to be RWA. It was one of the best things I have ever done for myself. Instantly I was part of a group that understood me. They understood how my comma placement was always wrong or that my run-on sentences did make sense after all. They were a group that showed me the ropes as a newbie in this crazy writing business. AND it was my drive that got me where I am today. 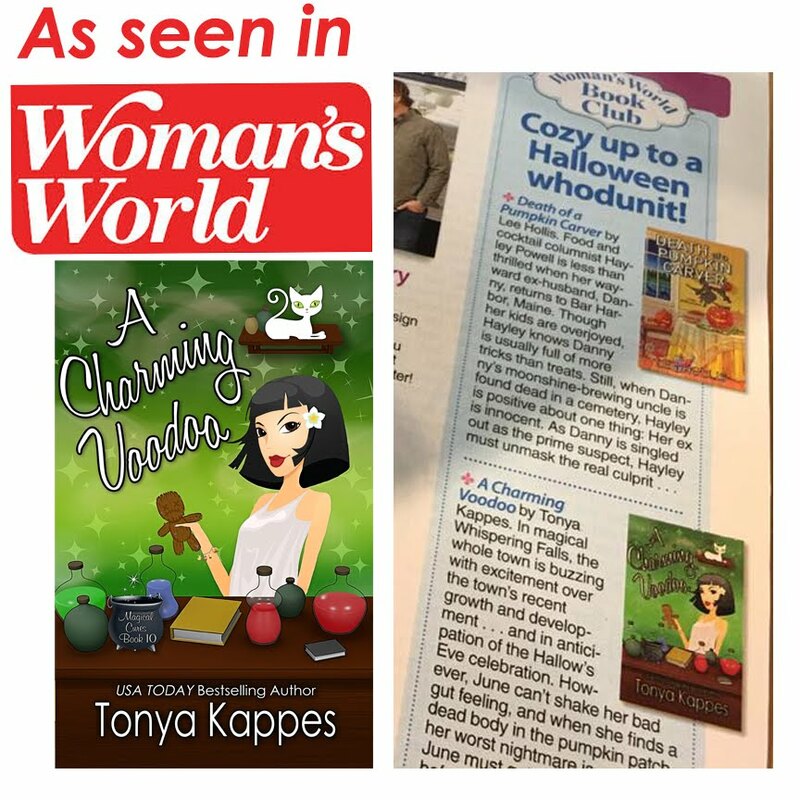 I even sat on the board for a couple of years as well as joined a few RWA online chapters. I sat on the board of the online chapters for two years too! I met a lot of great people, who I still consider my real good friends. Then RWA does the unthinkable. They refuse to open their eyes and move into the 21st century. Do I sound like some disgruntled author....no. I have done all roads to publication and still believe in them. RWA does not. That is a problem for me. I have been a long time supporter of RWA, not as a member, but as a big cheerleader for them. 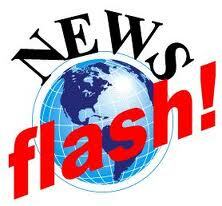 I have encouraged countless of new authors to join, give all they have to the group. I have given RWA two years, 24 months, 731 days, 17, 532 hours, or 1,051,898 minutes (however you want to put it) of my life waiting on them to change. Waiting on them recognize self-published authors in some way. Don't get me wrong. I know there is a lot of crap out there and writers who put up some written words because anyone can self-publish. BUT what about the real authors? The ones who do turn down contracts with publishing companies? Ones who drop agents? Ones who get their rights back? Ones who travel all roads to publication? This week I got my renewal in the mail. As if not recognizing my bestselling novels is not good enough, they stick me with a RAISED membership fee. This sent me soaring! So I had to sit down and make some really big decisions. First off, YOU need to realize that writers are NOT your target audience. I know that YOU are not going to buy my fiction novels. You might buy my non-fiction novel (which I highly recommend) because it is for YOU. It teaches you how to market and promote. This blog is for YOU, the writer, not my readers. My STREET TEAM is for my readers, not YOU! Why am I pounding this into your head? Because writers think they HAVE to be a member of RWA even if they don't write romance. Why? Because for some great marketing reason, RWA has made writers believe that they are the end-all-be-all of the writing community. 1) Monthly magazine that has a TON of adds for books and articles that I can find online for FREE...hmmm....again....why do writers advertise in this magazine? 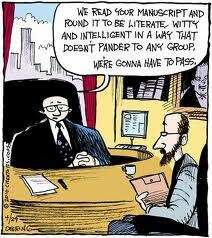 WRITERS ARE NOT YOUR TARGET AUDIENCE. Dollars wasted!!!! 2) An invitation to their national convention. OH! They teach craft classes!! Shhh....you can take those same exact classes on Savvy Author for HUNDREDS of dollars cheaper. 3) BUT Tonya, I get to meet up with my writer friends. Yes you do. BUT did you also know that you can meet them anytime of the year. You have to plan it. 4) You can get an award. Golden Heart or Rita. What do they get you? NOTHING! I know a gal who has finaled in the Golden Heart four times and still doesn't have an agent....Oh and another girl who enters the Golden Heart every year but changes the title of her manuscript each year. That is sad to me.....BUT my novel, Splitsville.com is a 2012 double finalist in The Next Generation Indie Awards and THREE libraries have already picked up my books through the final! Cool! Here I sit, wondering what I was going to do. Was I going to rejoin a national organization that believes that the $50k I have made in the last eight months really doesn't exist? Or was I going to look at an Indie organization that is really instrumental to my career? Oh...what about that local RWA group? Yes! I do love each and everyone of them. They have become my friends. Some of them visit my blog from time to time AND I have no doubt they will remain my friends. BUT they are NOT my target audience. Instead of joining RWA, I'm taking that $95 and investing who my target audience is. You, my blog followers are my target audience for non-fiction, AND my readers are my target audience for my fiction. This had NOTHING to do with indie vs traditional publishing. This have EVERY thing to do with business decisions. I have several traditional published friends who will not be rejoining as well. Why? Because RWA has nothing to offer. They have done nothing to change or nothing new to offer their members. When I got my agent, I asked her some really tough questions. MY QUESTION: Do agents really care that I'm a member of RWA? AGENT ANSWER: No. If you have a good book, you have a good book. I always tell my agents who I send to those conferences to make sure they take at least a partial of each pitch. 99% of the time we do not offer representation. MY QUESTION: So if I didn't renew my membership, I'm going to be okay? AGENT ANSWER: I'd rather you spend time writing. The long and the short of it~my local RWA writing group was the best thing I could've done as a new writer six years ago. That was six years ago. Now you can join so many groups online or even find writing groups in libraries. Times have changed, and it's time RWA does or they are going to keep losing GREAT writers left and write...right! For the last few months I have been a member of Triberr. I became a member when my friend, Rachelle Ayala, invited me. To tell the truth, I had NO CLUE what Tribber was and what it was about. Heck...you know I'm up for anything, so of course I JOINED!! And....I had no clue what I was doing until last week. Soooo....I asked, begged Rachelle to do a guest post on Tribber. What is Triberr? Simply put, Triberr is semi-automated retweeting of blog posts by a group of people working together. 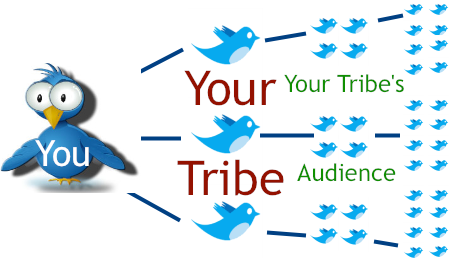 Triberr is a website that collects blog posts and Tweeps into a group called the Tribe. 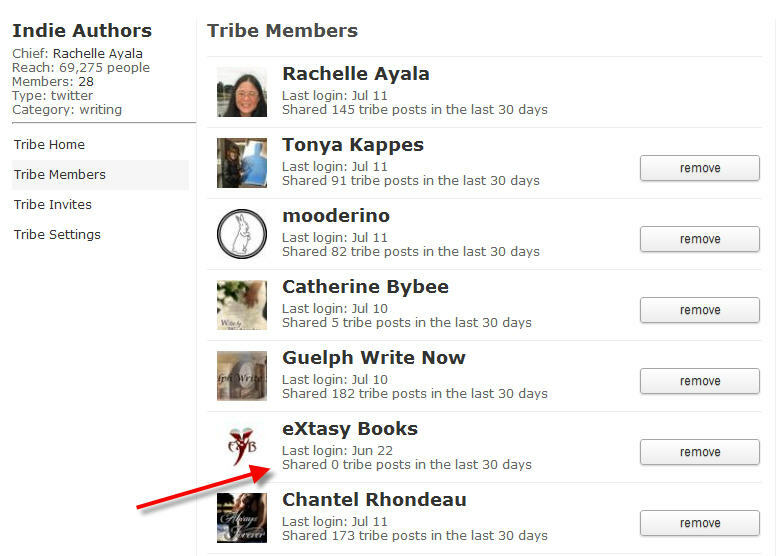 Tribes are groups of bloggers who post on similar topics and are happy to share the posts of other bloggers. As you can see from the graph (found at the Triberr site), using Triberr extends your blog tweets beyond your followers, but into the streams of all their followers too. And this is a big thing! Because, guess what? Blogging in isolation is about as interesting and productive as navel gazing. Okay, I'm going to show you how to join and work with Triberr in 5 easy steps. 1. Get a Twitter account. Go to Twitter.com and register for an account. 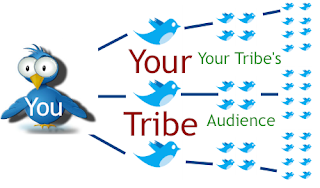 Connect your Twitter account to your tribe. 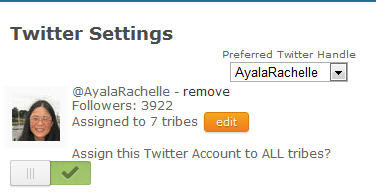 You may have more than one twitter account, but you may only connect a single Twitter account to a single tribe. Here I have chosen to connect my one twitter account to all my tribes. 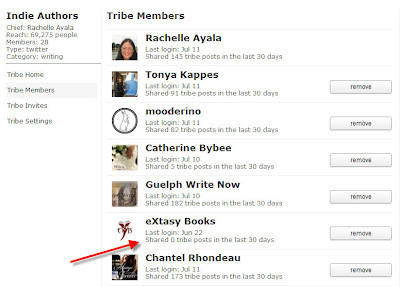 Connect your blog to a tribe. 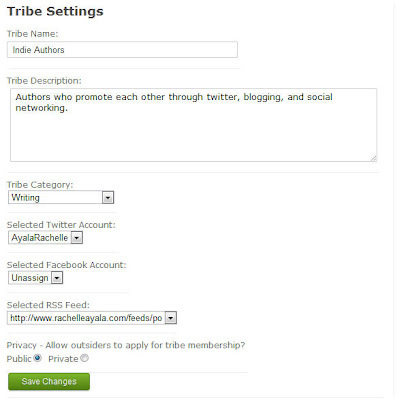 You can be a member of different tribes and connect different blogs to different tribes, but you may only connect a single blog to a single tribe. I chose not connect my Facebook account, because I did not want to flood my Facebook page with tweets. 3. Join a Tribe. You can start your own tribe or find a thriving tribe to join. The best tribes consist of members in the same interest are who are willing to retweet each other's content. So for example, if you are blogging about ancient civilizations, it might not work to be in a tribe of science fiction enthusiasts. 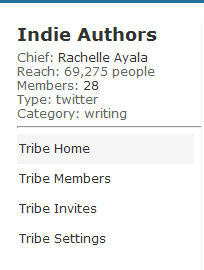 My tribe is "Indie Authors"
You can set your posting interval to make sure you don't flood your tweet stream. 5. Stay in the Tribe. As of June 28th, Triberr is now limiting tribes to be no more than 30. I have recently had to ruthlessly remove nonparticipating members, even when they were my personal friends, to make room for better teammates. Your tribemates can easily see if you've been sharing or not. You can also remove yourself from a tribe if you find they are not a fit. There are no hard feelings either way. So what are you waiting for? 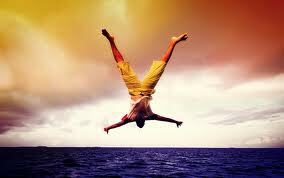 Jump into Triberr and watch your blog grow. I started in April (see intro post) and watched my blog traffic go from 10-20 a day to 200-300 a day. So that's it! I hope this blog post has been helpful! You can visit me at my blog, Rachelle's Window. Monday we took a dive into the waters of Goodreads and HEAD FIRST, if I say so myself! 1) Join Goodreads. . .NOW! 2) Find and claim your published books. 3) Join the author program. 4) While you wait to be approved for the author program, beef up your profile. 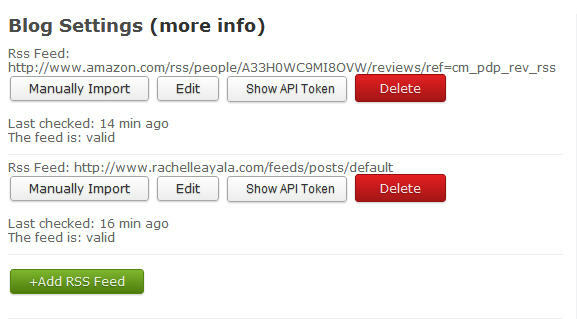 5) Add your blog RSS or Atom Feed. Today we are going to explore how to get some of those 5 million people on Goodreads to notice us! Why Goodreads? BECAUSE I said so. No, really. Think about it. There are three people who join Goodreads: READERS, WRITERS. . .um. . .okay, TWO BIG reasons! BUT the component is BOOKS!! Everyone on Goodreads is there to connect over BOOKS. Good for us because that is what we do! Today we are going to look at GROUPS and how to join them and why! The people! Most of the people who belong to Goodreads are not only readers, but they are BLOGGERS! 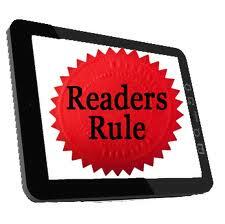 Bloggers who read, have readers who follow them, readers who read their blogs, and they write reviews. Like any other groups that are on other social networking sites, Goodread groups have rules about promotion and more, so you have to read all of those before you go and post what you think you can post. 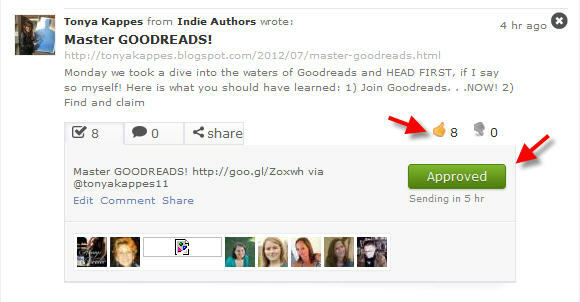 1) Click on the GROUP tab at the top of the Goodreads homepage. It will take you to a page of listed groups that are in columns: my groups, popular groups, ALL sorts of groups! On the right side you will see TAGGED groups or what I like to call TARGETED groups. I joined a couple target groups for Chick-lit and Mystery. WHY?? Because that is my targeted reading group....duh! Here you want to explore the groups, and see if they are right for you. THEN join! If the group is NOT right for you, after you have joined, they won't hold you hostage...simply leave the group and go to the next group. It's a little like speed dating. (Is if I'd know....) But if I did have a history of speed dating...that is what I'd think it was like *wink*. The groups that are categorized as POPULAR and RECENTLY ADDED, are ones you should definitely take a look at. These are obviously where readers are going to check out first. 2) After you join you will want to check out the BOOKSHELF in the group. YOU WANT TO BE ON THE BOOKSHELF!! How? Easy. . .top left is a search box for the bookshelf of your group, simply type your name in and see if your book pops up. If it doesn't, your books will pop up and you simply click the add button. Sometimes the moderator has to approve your book to be on the group bookshelf. You want to know who the members are. You might even be friends with a couple of them. 4) Discussion tab! I LOVE THIS TAB! This is where you will see all the topics or create a new topic in the group. It's great! You need to go in and introduce yourself in the introduction topic thread AND make sure you introduce why you want to be a part of the group...NOT BUY MY BOOK!! You have to be a genuine, likable author!!! If there is an event scheduled for the group, like an author interview or skype session, it will be listed here. These are fun! Go into the poll section where you will be able to see what the readers LOVE or HATE. In one of my mystery groups, the members vote on cozy themes they love best. Most of the time it is exactly the OPPOSITE of what NEW YORK PUBLISHERS say is selling! Why did you need me to breakdown the part of Goodreads and why is it important to you? BECAUSE THE READER HAS DONE ALL THE WORK FOR YOU! Let me retype that. * The reader has already put themselves in a genre. Your target audience. * There are group discussions that you can participate in as well as take advice straight from your target reader! * You can see who is active and who isn't. The active ones are your reviewers and bloggers!! GET TO KNOW THEM! ~offer a FREE copy of your novel for their review...HONEST review. ~participate in the group discussions and DO NOT SPAM!! ~look at the discussion threads and see if you can write a blog post that you can put in the thread. This will help you gain blog followers and readers. All in all, Goodreads is a place to be genuine, commiserate with like-minded people, and meet some new bloggers/reviewers. Take the time to get to know them. Don't jump in and market yourself. REMEMBER, you are making an impression on them. You are giving them your branded image. Be kind. Be smart. PARTICIPATE! As if me telling you that being on Facebook and Twitter isn't enough social media. . .GOODREADS is where you need to be. . .too! Yes, you still have to be on Facebook and Twitter, but I also want you to start a Goodreads account. Good question. You have a blog, website, Facebook and Twitter. You are reaching a lot of people this way, BUT are you reaching your READER target audience? You know that I'm all about my readers! Goodreads is a place where readers and writers gather! When someone joins Goodreads, they are there for the intent to connect by books. THAT is a plus for us! That is exactly what we are looking for. Go to Goodreads and join. You will need to create an account. This is pretty easy and self explanatory. I highly recommend that you join the Author's Program. You can only do this if you have a published book. When you enroll into the program, you will be able to search for your book in the search box. If your book doesn't come up, you will need to ADD YOUR BOOK MANUALLY. Wait. . . you aren't done. You will be asked to verify that you are the author. In the box where you verify, you will need to tell them that you would like to be enrolled in the the author program. Then you will wait for Goodreads to verify who you are. This could take up to a couple days. Don't sit on your laurels while you wait for them to get back to you about the author program. You are still a member from when you opened your account, so go to your profile page and beef it up. Be sure to add a profile picture (good one!) and blog site. You want to have all this done so when you do get approved for the author program, you are ready to go. Make sure you click save at the bottom of the page. Now it's time to start building your "friends" list. Now some of my friends are carry over from Facebook and Twitter, while some are readers who happen to find me on Goodreads. Plus there is you! My blog followers. Why blog followers? So glad you asked!! You will need to put your blog RSS or Atom URL on your page. This will post your current blog posts on your Goodread page and you will reach more blog followers and that is NOT a bad thing. SHEW! Did that wear you out?? There are over 5 million people on Goodreads. I can guarantee that there are a lot of readers that read your genre, that would LOVE to connect with you. Now that you are well on your way. . .I think this is enough for one blog post. Stay tuned for Wednesday when I tell you tips on how to connect with some of the 5 million friends! OH!! Friday we have a special guest explaining everything you need to know about TRIBBER!!! As we all know, publishing houses have always been the gatekeeper of the author. They were the ones who stood at the GATE OF WHAT READERS WANTED TO READ with their spears pointed to the outside world and only let you in if and ONLY IF they thought the reader was going to read you. The days are over where the publishing house GATEKEEPER stopped your book from reaching the hands of the reader. If those GATEKEEPERS don't like your novel, you have options to self-publish your novel and get it in the hands of the real GATEKEEPER. . .THE READER! And if you can't reach the new GATEKEEPER, then you have no one to blame but YOU. You are now responsible for getting pass the GATEKEEPER. 1) Be sure to know your target reader. If you write about assassin soccer moms, your tweets and facebook groups should be centered around soccer moms. Gently nudge them toward your facebook page and how you offer giveaways. With Amazon, Smashwords, and Barnes and Noble having a "gift this item" program, it's easier than ever to gift your novel to a potential reader. 2) Connect with readers on targeted reader blogs. Send a quick request to targeted blog owners and offer a giveaway of your novel. 3) Start a STREET TEAM! I can not stress this enough. I have connected in a way that most authors never dreamed possible! Once a month I will pick random STREET TEAM members and send them a small note or postcard in the mail thanking them that I appreciate them. Having my STREET TEAM has helped me connect with readers that I never knew possible. Over the past week I have been on vacation at the beach. I try to go a couple of times a year when I know it's my hardest time to get words written on a page. Those times of the year include the dead middle of summer (now) and the deep middle of winter (January/February). Writing a novel is like being in a relationship/marriage. You have to put into it to get something out of it. Some days we wonder if it's worth it, while other days we know we can't live without it. Oh yes, we bicker with our characters, the direction they want to go is sometimes the direction we don't want them to go. So it's about compromise...just like a marriage. You say you aren't the marrying kind? Well I'm here to tell you that if you are writing a novel. . .you are the marrying kind! Yes! WE all cheat on our novel when we hop over to the edits of the last novel or start to work on that new idea. But then the guilt settles in and you go back to the novel where you bicker with your characters, or don't invest in it, spend time with it. Think back about the times that the idea of the novel was new and exciting. Think about the history you took in creating those characters. Visit the places the inspired you to write those novels. Just spend a little time in that novel and let the creative flow take you away to the world only you can create. 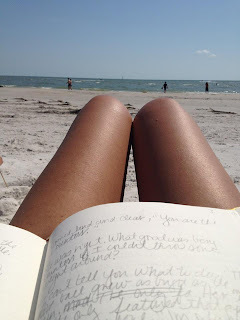 It only takes going to the beach a couple times a year, where nothing stresses me out~not the day ins and outs of negative people, negative reviews, naysayers, or the daily grind of work, to find that true love of writing that I have in my heart. How do you fall back in love all over again with your writing? As I'm sitting on the beach this week....YES! I'm at the beach! But I'm in my most least favorite part of the publishing book process. . . EDITING! It's the second book in A Magical Cure Series, A Charming Cure. And if you don't write mystery, you should know that I write my mystery novels backwards. And my editor would be more happy to tell you that she has to go over my work at least twice! I have come up with some great tips to help me and YOU get us through the editing process with a little more with ease. I know that we have our muse and want to start writing on the next project, but if you don't slow down and take your time, your novel will suffer by not becoming the best novel it can be. An easy way to do this, and what I have done while I'm at the beach, is to break my finished novel into four parts. Literally, I take the page count and divide it by four. This helps me work on one section at a time and not temp myself to work ahead. I'm a tad bit lazy in this editing department and anything I can do to get through it I do. Breaking it up doesn't seem so daunting. 2) Don't worry with the meat of the bones on your first round of edits. Make sure that you have the story down. Make sure the story is going exactly where you wanted it to go. Don't worry about the dialogue tags, or the description at this point. I'm sure you have most of that in there, but we are just looking at the story structure of the novel. 3) If you are further into your editing process, change the font on your computer. We have a tendency to know our novel so well that we can skip through it as if you were skipping through a meadow of flowers on the most perfect day. Nothing jumps out. BUT if you edit in a different font than you are use to, things have a tendency to stick out a little more. 4) When you are in your final draft of editing, send it to one of your readers! I have two GREAT readers that I trust with my novels. I have met only one of them in person and the other I have not. I trust them completely with my genre. They are avid readers. When they tell me something is off, or a character hasn't developed enough for them, I listen. Do you have any editing tips that will help us like the process a little more?